Brewster F2A-2 Buffalo fighter, in early war colour scheme and with the pre-March 1942 red roundels in the US star insignia. Panel included. The F2A was designed by the Brewster Corporation, which had formerly made carriages. Indeed, the F2A was Brewster's first attempt to build an aircraft, and the development took many years because of this. 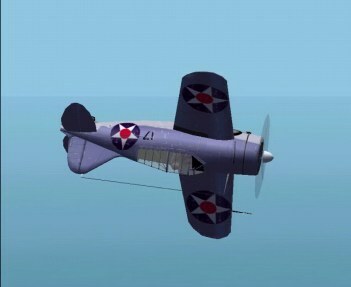 When the first F2A had been built, it was rejected by the US Navy for the Grumman F4F Wildcat, but later the F4F was cancelled and F2A accepted in its place. For its time, the F2A was an excellent aircraft, this being about 1937. But it was later outclassed by later models of the F4F Wildcat, and by the time of Pearl Harbor had been entirely rendered obsolete and was shot down in droves by the Japanese A6M Zero fighters.